What’s not helping the plight of the poor either is the rise of food speculation. In 1996, food speculation was 12% of all trade in food, but by 2011 the speculation part grew to 61%. Olivier de Schutter, the UN rapporteur on the right to food, believes speculation is behind surging food prices and renewed financial interest in land as an investment. The increase in the prices of wheat, maize and rice in past years, he has argued, was not linked to low stock levels or harvests but to traders reacting to information and speculating on the markets. In 2008 the world woke up to what rising food prices mean for the majority. But lessons have not been learned and measures taken so far are totally insufficient. On 15 January, the EU has finally put in some measures to curb the worst food speculation. The EU has now limited the use of financial instruments linked to commodities, making it a bit less attractive for speculation. The controls will place a limit on the number of contracts on agricultural commodities such as wheat, corn, soybean and sugar that banks and other finance companies can hold, and will force traders to open their activities to greater public scrutiny. That’s good news, but we have to see this in perspective. Years ago the Obama administration already forced measures through Congress to curb the activities of commodity traders through the Dodd-Frank act– but City bankers managed to block all progress here. Not only is the EU late, it also left serious loopholes in its new (and still to be ratified) agreement. This small step at tackling food speculation still fails to address the root causes of the current broken food system, which pits subsistence farmers and the hungry against the worlds mighty and hungry for profits, with the latter winning. It is between a vision of food sovereignty and the defense of peasant livelihoods v. corporate monoculture production for export as a way to feed the world. While land investments in Sub-Saharan Africa have gotten the most attention, they are happening across the world. In South America, we see that countries like Brazil are both targets of land-grabs as well as land-grabbers themselves abroad (for example in Mozambique) On the one hand, the country has been introducing legislation to prohibit foreign ownership of Brazilian land, but at the same time it continues to practice internal colonialism, land concentration and massive industrialization at the frontiers of extraction, both within its own borders and abroad, with a specific focus on agro-fuels. This is a particular feature of this most recent wave of land-grabbing, investor countries are not concentrated in the global North but include fast growing middle income countries such as India, Brazil, China, and Egypt, signaling a shift towards a more polycentric configuration of investment flows. All of these facts and figures become real when you see the faces of those impacted –watch Grabbing Gambela, an EJOLT production on land-grabbing in Ethiopia (8:37) and the trailer of the film Silent Land from filmmaker Jan van den Berg (3:00). 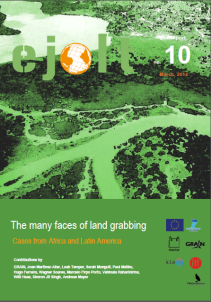 EJOLT just published “The many faces of land grabbing. Cases from Africa and Latin America”: 96 pages on land grabbing, agribusiness, biofuels, economic development, food security, food sovereignty, industrial agriculture, community land rights, sustainable agriculture, world food price crisis and water grabbing.